Welcome to my Trip Report on Hong Kong Airlines! Airbus A320 with 'sharklets' - I wasn't interested in flying this aircraft type, flew on this type too many times! Hong Kong Airlines is based in Hong Kong and was established in 2006. Its previous name was CR Airways and operated CRJ 200 and -700. 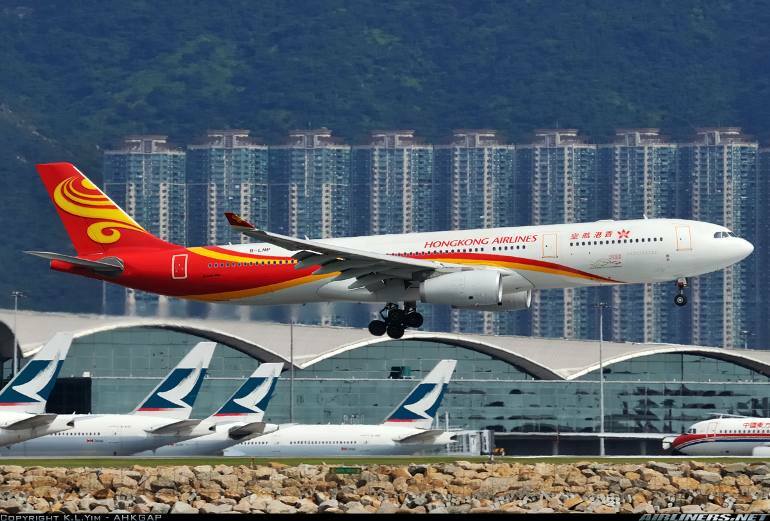 It was initially given a 5-years licence by the Hong Kong Air Transport Licence Authority to start commercial flights, cargo and mails to China and was free to apply traffic rights to 10 cities in China and this has of course been extended. This airline signed a MOU with Boeing for 30 Boeing 737-800s and 10 Boeing 787-8 Dreamliners and part of the order was from Hainan Airlines. 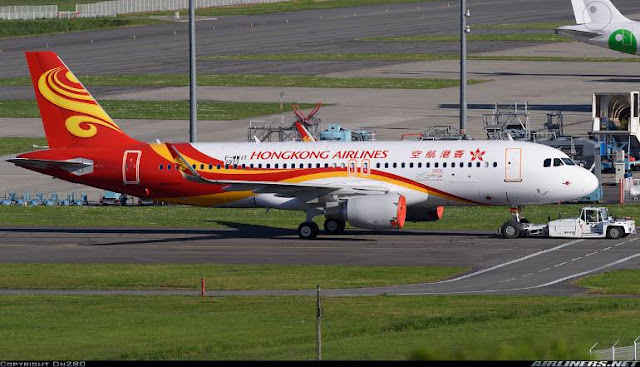 On 27th June 2006, Hainan took a 45 percent share of this airline and Mr Mung Kin Keung took the remaining shares 2 months later. After that the airline was renamed to Hong Kong Airlines and the existing livery was launched around that time. Somehow, the airline decided to become an All-Airbus fleet as the Boeing 737-800s were transferred to Hainan Airlines, while taking delivery of Airbus A320 and Airbus A330. The airline also placed an order for 10 Airbus A380 but this order has probably been cancelled or switched to the Airbus A350. On 27th May 2007, the airline IATA code was changed from N8 to HX. 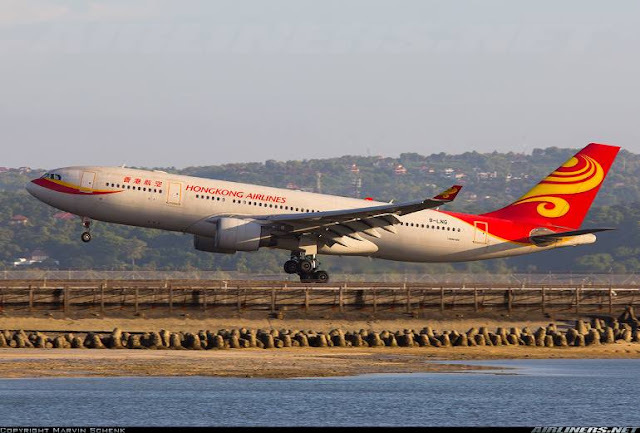 This airline has successfully started regional flights with the Airbus A330-200 and -300. It has even tried all business class A330 flight to London Gatwick but unfortunately, it didn't work out for them. Meanwhile, the airline has been introducing new routes while improving its products and service. In 2014, Skytrax has awarded this airline as the 'World Most Improved Airline'. In 2015, the airline has a fleet of 25 Airbus aircraft consisting of 8 Airbus A320, 9 Airbus A330-200, 5 Airbus A330-200F and 3 Airbus A330-300 and it has 17 more Airbus A320, 1 Airbus A330-200, 2 Airbus A330-300 and 15 Airbus A350-900 on order. 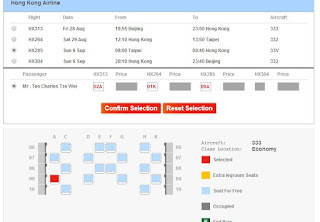 Hong Kong Airlines is currently not in any airline alliance but it has its own membership - Fortune Wings which you can join and earn miles to redeem, just like any other premium carriers out there. 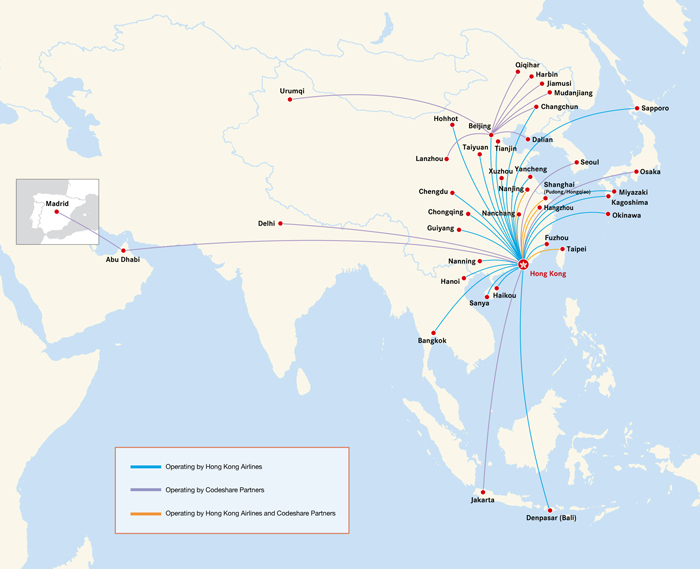 You can use Fortune wings membership on the following airlines: Hong Kong Airlines, Hainan Airlines, Grand China Air, Lucky Air and Tianjin Airlines, Etihad Airways and Air Berlin. 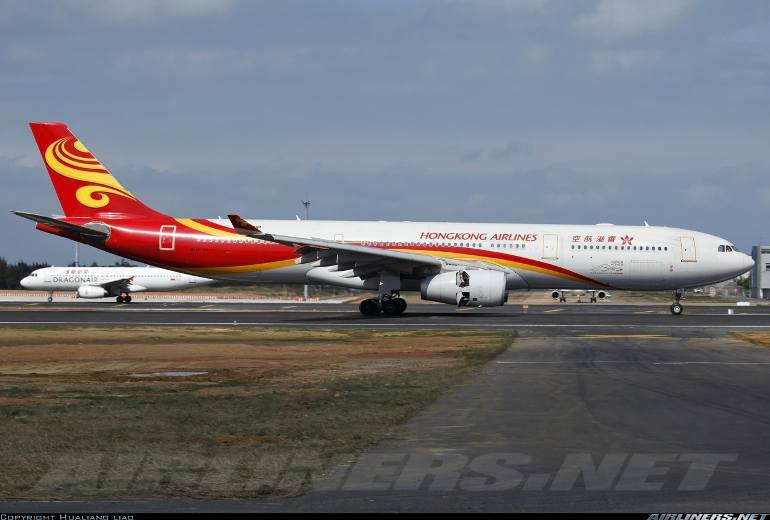 Flying with Hong Kong Airlines was in my short list for quite a while. 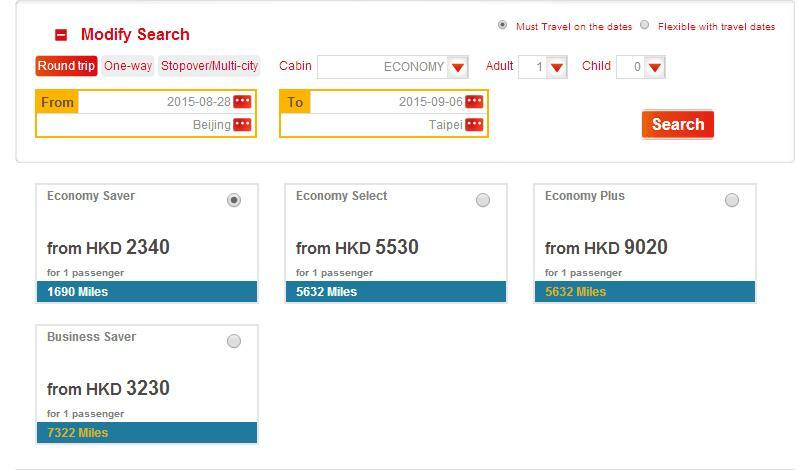 I checked the airfare for Beijing to Taipei return and this airline along with Air Macau offered the cheapest option. 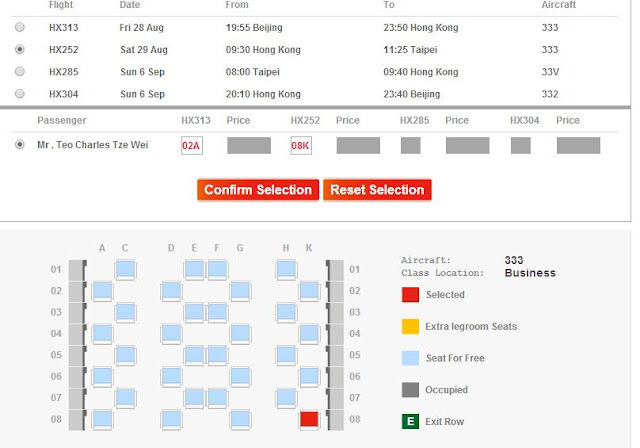 Doing more research on both airlines, I realize Hong Kong Airlines was offering only S$100 more for Business Class and it was a no-brainer that I picked Hong Kong Airlines and booked myself on Business Class for this return flights. 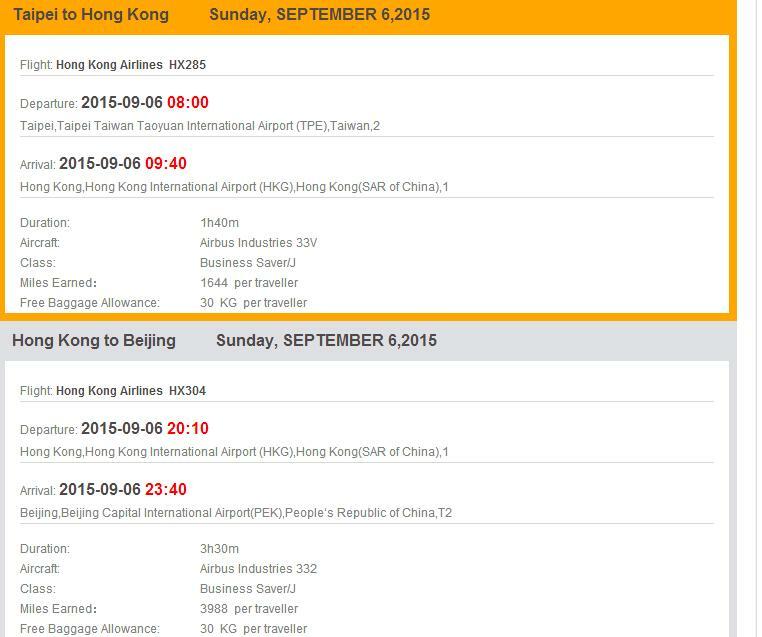 There are pros and cons about booking with Hong Kong Airlines on this flight route. The advantage is there are many flight options for you to choose and the airfare is pretty cheap. The disadvantages are frequently late departure and arrival, limited partners in mileage program and the airline has both old and new cabin, so depending on the timing on your flight and aircraft type, you may fly on the old cabin for all 4 sectors, and I will be doing reviews on both products. The website is pretty basic, similar to Xiamen Air but I find it slightly more user-friendly. When I checked the Business Class Saver price, I immediately went for it. 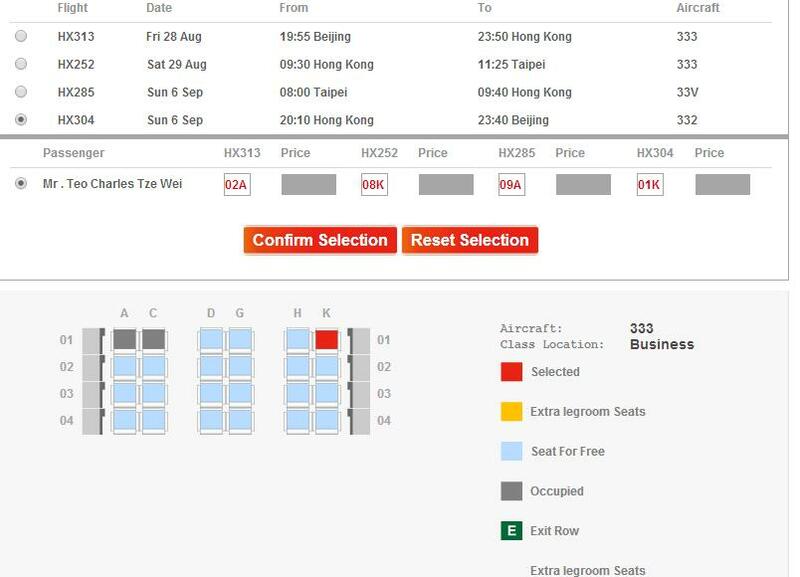 The price difference between Economy Saver and Business Class Saver was just S$100 difference. So once that was decided, it was a matter of choosing my seats. 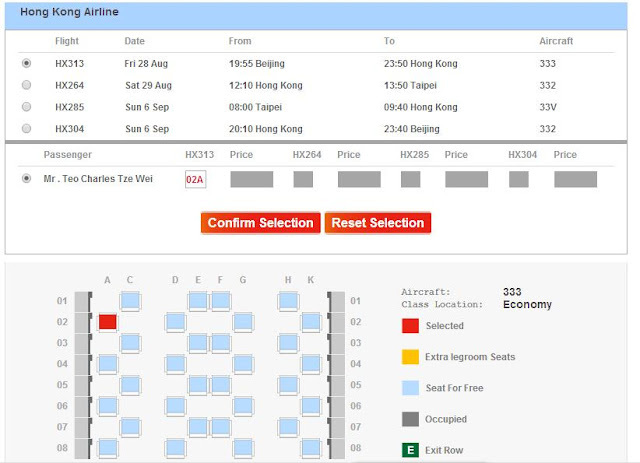 One advantage about flying with Hong Kong Airlines is there are many flights from Beijing to Hong Kong and Hong Kong to Taipei, so you can go along with your schedule. If I have known that HX285 flight was changed to an old Business Class cabin of the Airbus A330-200, I would have picked a later flight. Unfortunately, my seat selection for all 4 flights were changed, but I managed to get the seat of my choice when I did the online check-in. You can do so 48 hours before departure. Apparently none of the aircraft's numbers starts from row 1. Row 11 is the first row. Here are some photos of Beijing Airport Terminal 1, 2 and 3. These photos were taken during my 8 hours layover at Beijing Capital Airport. Do take note: Terminal 1 and 2 are connected by a walkway, there are signs to lead you there in both Mandarin and English. While walking through the walkway, you can see the tarmac and the windows allow you take some nice photos of the traffic at the tarmac. This is China Eastern's Airbus A321 fitted with 'sharklets'. This is the departure hall. This terminal was reopened on 27th June 2008 after some minor renovation. Looks pretty modern with some restaurants at the corner of the hall. Business Class check-in counters for the Grand China and Hainan Airlines passengers. It was pretty quiet at that time. There are self check-in kiosks available for airlines using this terminal. Only these airlines as shown below operate from this terminal. Lounges are available for major Chinese Credit Card members at the land side. Terminal 2 was opened on 1st November 1999 and was used to replace terminal 1 which undergone a major renovation. All international flights used to operate from this terminal until terminal 3 was opened. This is the air side leading to the arrival hall. The interior of the terminal 2 looks pleasant. This is the domestic departure hall which I used when I was on my way back to Xiamen. China Southern and Xiamen Air share the same check-in counters. For international flights, you have to follow the sign and head to the other end of the terminal. Just 5-10 minutes you walk, you are there. This terminal isn't very big. This is the drop off point just outside the departure hall. Beijing Capital Airport is pretty modern and easy to get around. You can check where your airline's check-in counter is located in terminal 2. This is a floor above the departure hall, where the restaurants are and the local staff standing out the restaurant will persuade you to enjoy your meal at their restaurant. I went to the Carol Cafe and ordered this meal, the spicy and sweet beef rice. Not bad! Got myself a local beer, have to try one every place I go. Once my stomach was satisfied, I made my way to terminal 3 by shuttle bus. This shuttle bus may rest at the bus stop for a period of time, so be prepared to wait. For this time, the driver had the engines off and it was quite stuffy inside. Waited for about 15 minutes before he finally fired up the engines and drove to the next terminal, terminal 1. The bus will drive in a loop ( Terminal 3 - Terminal 2 - Terminal 1 then back to 3) The journey from Terminal 2 to Terminal 3 including the stop over at Terminal 1 takes around 20 minutes and so if you need to transfer from terminal 1 or 2 to 3, do plan ahead, give it about half an hour. The nicest and biggest airport among the the 3 terminals. It looks very similar to Hong Kong Airport and is airport photography friendly for plane spotters. Currently, its the 2nd biggest terminal in the world, Dubai's terminal 3 holds the top position. This terminal was opened in stages and was fully operational in 26th March 2008. Here are some photos of this terminal. Once I got off from the bus, I headed to the entrance. Doesn't this remind you of Hong Kong? I am definitely impressed with the size! Free Wifi is available here. Walking through the spacious departure hall. Its a lot better than the other two terminals. Air Asia Zest uses this check-in counter. Some traffic at runway 18 right, and my first sight of Air China's Boeing 747-8I! It was heading to Frankfurt. Duty free shops at this level while the restaurants are a floor up. Domestic and International departures are at different sections, check the signs for direction. Quite a number of people were watching the take off. This is taken from the other end of the terminal. Walking from one end to the other takes around 15 minutes. Are you lost? Check out the Check-in Area Diagram for information. This terminal is impressive; it is passenger-friendly and have most of the facilities passengers want. I have to try departing and arriving at this terminal the next time I return. There are also self check-in kiosks but not few were using it. Heading down to the arrival hall. Arrival Hall is just as massive! Took the escalator to the ground floor and that was the end of the tour. There are buses to many destinations, but there are signs in English to help you. This is the shuttle bus that takes you to all the terminals. I hope you find this brief information and photos of the 3 terminals useful. I headed back to the terminal 2 and had an hour to spare, I did some email before checking in for my flight to Hong Kong. Checking Flightradar on what aircraft I was flying on, apparently the aircraft took off late at Hong Kong Airport and I knew it would be arriving late, and was prepared for a late departure, no harm done to my schedule though. Back at terminal 2, I was at the International Check-in counter. You have to clear security before entering to this section. It was pretty quiet at time. The queue for the Economy Class was very long but there is a separate queue for web check-in. I was originally at the Business Class queue but the queue at the web check-in was shorter so I joined it - bad decision. The couple and the male passenger in front of me took a long time to clear. For the male passenger, it was because of some items in this baggage that needed to be removed, but he went to the side to sort it out. The male passenger in front of me wanted to hand carry his "small " luggages and he headed over to his girlfriend to bring the luggages over (wasting time). I was puzzled, why didn't his girlfriend turn up with him and the luggages in the first place since she was also flying. I don't think I am the only confused one. Anyway, both luggages were placed on the weighing scale and it turned out to be heavier than what was allowed on the overhead cabin. Instead of letting the passengers (us) behind them go first, they did their packing at the spot (10 minutes plus) causing a further delay for the rest waiting behind and the counter staff didn't bother moving them elsewhere to sort it out. Thumbs down for that! By the time my turn came, the business class queue had already finished 6-7 passengers. I was pretty pissed off at this point. This male passenger was in front of the couple, but he was not to be blamed. The staff confirmed to me about the delay, which was a good thing for me. I could spend more time at the lounge, cooling myself down. Got my boarding pass for both legs, Beijing to Hong Kong and Hong Kong to Taipei, this means I don't have to leave the air side at Hong Kong Airport. Boarding pass for the 2nd leg. This boarding pass is different from the one issued at Hong Kong and Taipei Airport. This is my boarding pass for this leg, I have to make sure I give the airline staff the correct boarding pass when boarding this flight. Invitation to the BGS Premium lounge located near gate 5. Once I collected my boarding pass, I made my way to the air side and took some photos along the way before heading to the lounge. Pretty quiet with all these duty free shops staff looking on in boredom. This lounge is for Air China's First and Business Class passengers. Checking my flight, there wasn't any update on the delay. This was where my flight was departing from. It wasn't very crowded at that time and there were kids in there. I really envy them! There wasn't many folks in the lounge initially then it got crowded not long after. Most of them were on the same flight as me. What's important was the food and beverages! There is a monitor screen to keep track of your flight. 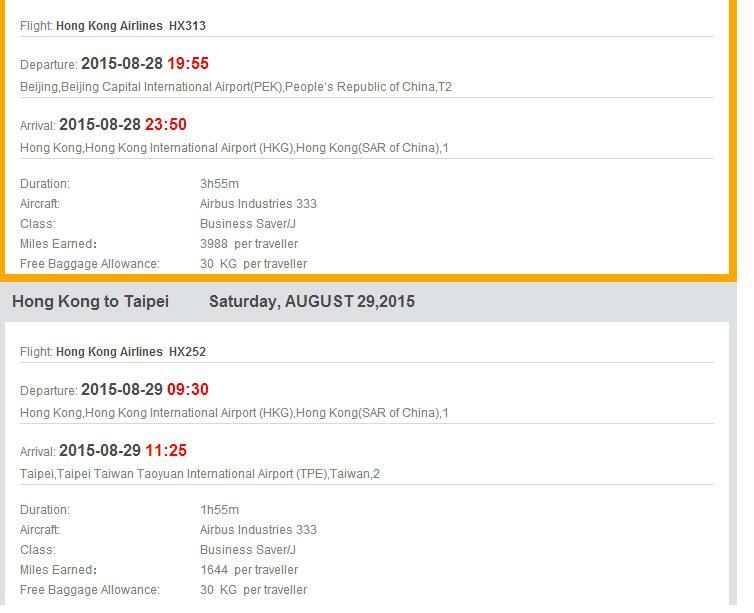 No announcement is made for your flights so you have to keep track your flight yourself. My appetizer - a glass of tomato juice and a bowl of porridge. Followed by a can of Tonic Water and my main course. The food was average, but it did satisfy my hunger and ease my anger. My mood was better after that. I decided it was enough since I was going to have another meal on board my flight. I did some checking on my aircraft and at that time, it was still on its way. B-LNP, one of the airline's 3 Airbus A330-300 taking me to Hong Kong. Traffic was pretty busy at that time, so it wasn't surprise it landed even later, at around 8pm which was supposed to be our departure time. I made my way to the gate and hang around there. Many passengers were wondering why the aircraft hadn't arrived. You can hear the conversation among themselves. Looking at the passengers, there were a handful of Caucasians on this flight. There is a playground at the air side, the small little ones would certainly enjoy it. Spotted Hainan Airlines' Boeing 787-8 Dreamliner resting. Heading to the gate, it was pleasant to be departing without much crowd. This is the passengers for my flight, not many were happy with the delay. It was quiet at most parts of the terminal. After 20 minutes of waiting, B-LNP appeared. The worst thing about this delay is there was no announcement or apology from the staff counter at the boarding gate. Perhaps the check-in staff had mentioned about it to but it would have been nice if further updates have been made. The Economy Class queue started around 20 minutes before boarding commerced. I was happy to skip this queue for a change. B-LNP would not get much rest as the ground crew had to turn this aircraft around quickly. The aircraft's reverse thrust is being deployed to slow the aircraft down. There were two aero-bridges connected to the aircraft. Announcement was made to board the aircraft and I joined the shorter queue and made my way to the first door. I better not get used to this! I was the one of the first to enter the aircraft and the senior purser greeted me and showed me to my seat. Once I settled down, I was offered a welcome drink and then a towel. The cabin crew were quite friendly and they spoke good Mandarin. I remember one of them was a Taiwanese and the rest were from Hong Kong. I was relief to be boarding the aircraft at this stage and at that time, I was looking forward to enjoying myself for the short hop to Hong Kong. Photo from my seat, it turned out to be 90% full, I guess the other passengers had also taken advantage of the low Business Class deal. This is also the newer Business class product on the Airbus A330-300 and a few of the Airbus A330-200 have this seat product. It has 8 rows of 1-2-1 seating configuration . You can choose to seat together or separately as certain rows (alternate) allow you to do so for the middle section. There are a few disadvantages of this seat product. At the hand rest near the remote control, my elbow kept touching the buttons of it, causing the program on the IFE system to either stop or exit, and that is frustrating! When my elbow stuck out at the hand rest near the aisle, it hit the cabin crew a couple of times, felt bad about it. In the end, I kept my elbow off that hand rest area. Lastly, I find the aisle seat lack of privacy as the seats (middle aisle and window aisle) are diagonally across from one another, meaning the seat mate sitting a row behind at the middle section can see everything I do and I can see everything the seat mate in the middle front row diagonally across me is doing. So if you like privacy, choose the window seat. The last row near the window seems to have more privacy but its close to the cabin crew's work space and can be noisy. If you are sitting beside a seat mate (stranger), there is a divider for privacy purpose. The window seat passengers would get at least 2 windows for themselves. Thai Airways and Emirates are airlines that use this Business Class Product on the A380. In fact this is my 2nd time experiencing this product, my first time is with Thai Airways' Airbus A380, you can check out the trip report over here. Welcome on board, Hong Kong Airlines! Each seat is provided with the pillow and blanket. This is my seat for this flight. The cabin crew was welcoming the other J class passengers. The gap between the seat and the otterman. More photos of the Business Class Product. Taking photos of the cabin was definitely allowed. Unlike Xiamen Air, phones in flight mode can be used during cruising but like other electronic devices, it cannot be used during take off and landing. 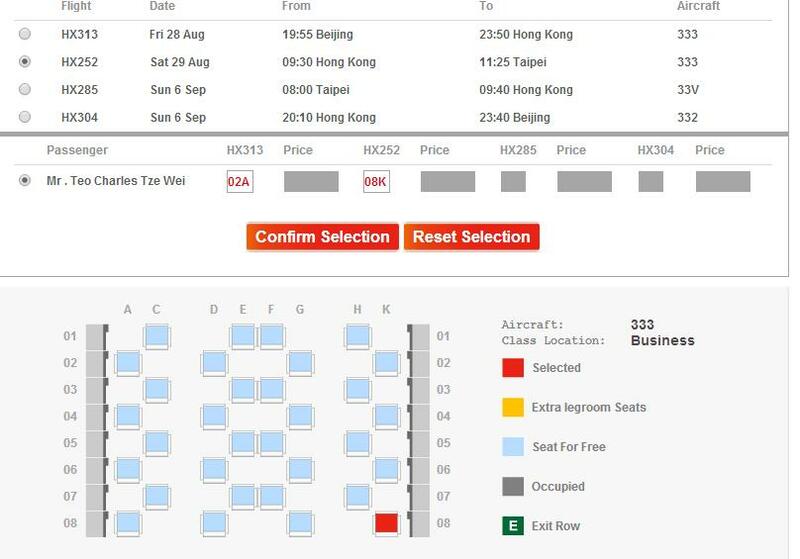 I guess Hong Kong Aviation Authorities has not given the green light yet. This photo was taken when everyone was seated. These photos were taken during the flight. Most passengers were enjoying their programs. A bottle of mineral water and headset are provided at the side compartment. The view of outside. We were still at the gate, waiting for the last cargo to be loaded. The Captain gave us a welcome speech and kept us well updated about the flight details and weather at our arriving location. The lamp light and the magazines. Initially, I placed my bag over there but the cabin crew told me I wasn't allowed to do so and had to put in the overhead compartment. Do take note of these instructions. During the flight, I managed to hop over to the Economy Class section to take these photos. It looks full back there. The 2-4-2 seating configuration is a favourite among frequent travellers. IFE (In-flight Entertainment System) looks good in Economy Class! There's a handle to hold just in case of bad turbulence. Normal toilet, nothing special about it. What's inside the magazine folder? Airline's safety card for B-LNO and B-LNP. This system is AVOD and the screen is 15.5" TV monitor, only the Airbus A330-200V and Airbus A330-300 aircraft have this system. I find it to be quite user-friendly and responsive. I prefer using the touch screen as I get to my program faster than using the remote control. Of course if you are lying flat while watching a program, using the remote control to change the channel makes more sense. I didn't have much difficult using the remote control though. Here are some photos of it. The start up page. Comes in 5 different languages. Checking the movies option, the selection was similar to the one on Xiamen's IFE system on the 787 Dreamliner. There are quite a number of cities I haven't heard of! I decided to watch this movie, and I enjoyed it. For the 3 hours flight, I manage to watch 2 movies. The IFE system is ready for use from the gate of departure to the gate of arrival, so only during safety briefing and announcements, the rest of the time you can enjoy the entertainment provided by this system. Enjoying the movie in comfort! The screen's size is just right for my liking. Checking my flight's current position, we had around an hour more to go. I had a choice between water or Orange Juice, I chose the former. A hot towel was then served. During the aircraft's taxiing to the runway, the cabin crew took our order and continued to do so after the take off (after the seat belt sign went off). The business class menu for passengers to decide and the cabin crew will take it back the passenger's order is confirmed. I chose the chicken breast. I chose the Hong Kong Milk Tea for my beverage, quite nice. The meal was served about 20 minutes after departure, it seemed the crew were eager to finish the meal service quickly. I find it to be quite tasty. Grilled Chicken Breast with Cream Sauce - The chicken was a bit hard but it was not bad, nothing special. I had a choice between this and the seasonal fruits, I decided to treat myself a chocolate cake and another round of Hong Kong Milk Tea. Too much sugar, but since I was on a vacation, why not give myself a treat, right? Once the meal was done, a wet towel was provided. The meal service ended about mid-way through the flight and then the crew switched the cabin light off so that some of us could rest. The cabin crew serving in business class were nice and friendly. A few of them were reserved but they took care of us well and what I like about this crew serving my aisle, she kept offering a refill. It may not be the best business class service I experienced so far, but they have done a professional job, and I can't ask for more. To be even better crew, they could open up more to the passengers and when they get the chance to communicate with the passengers, they could ask them if they are ok and if they need anything, feel free to look for them. I have to give them credit though is that they didn't show any sign of tiredness or laziness through out the flight and were there to wish the passengers farewell when the doors were opened at the arrival airport. I find the Roll Royce Trent 700 engines a bit noisy during take off but quiet during cruising. The flight was generally smooth, we had a few bumps and the seat belt sign came on. Announcement was made regarding the seat belt and cabin crew were told to return to their seat and apologised to the passengers for the service to be halt. Credit to the crew, they continued to work when the ride was smoother. The Captain updated us a few times on the weather and explained to us that the ATC (Airport Traffic Control) delay at Hong Kong was the reason for its late arrival. So credit to the flight and cabin crew for this lovely flight. Some photos of the landing at Hong Kong Airport. We were parked at a remote parking lot and alighted the aircraft via staircase and transported to the terminal building by bus. Don't think many passengers were happy about it especially after the delay. Only this door was opened so it took a while for all the passengers to alight the aircraft. Thanks for the ride, B-LNP! I wasn't happy with the incident at the check-in counter especially the selfishness of this couple. I felt that the check-in staff should asked them to move to one side and check in the other passengers first, saving both her time and other passengers. 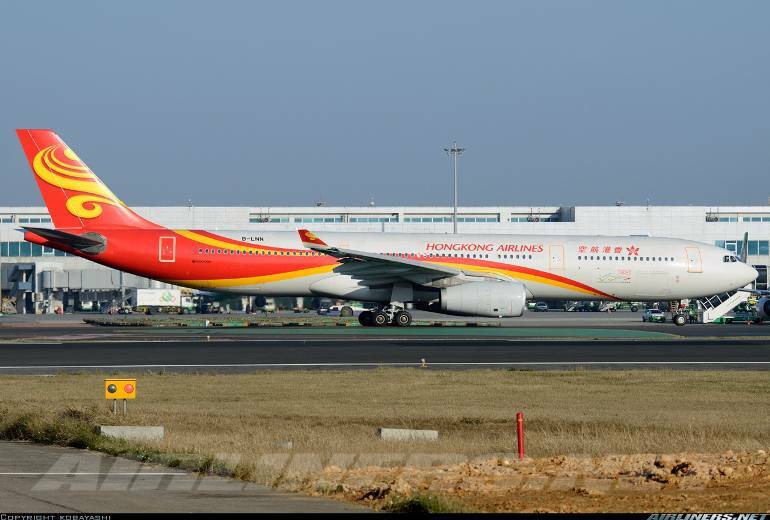 The late arrival of the aircraft should have been announced by the Beijing airport staff and informed the passengers of the late departure, allowing them to roam around the air side a while longer instead of keeping them waiting at the gate, uncertain of the flight's situation. Luckily, this batch of passengers was patient. As for the airline's product, I am not a fan of staggered configuration, finding it to be cramp and the lack of privacy at the aisle window seat is a thumb down from me. However, the in-flight service, IFE system and meal made up for me. Not the best in the market, but was certainly good enough for this short hop. If you fly with this airline, don't expect the flight to depart on time. So far among my 4 flights with this carrier, only 1 was punctual. I will give an overview of this airline on my part 4 of this airline's trip report. Thanks for reading! Hope you find the information useful.